Number One Nemesis is a lovely warm charcoal grey (see here on it's own) with warm undertones and gold glitter so I wanted to try and marry in some stamping. 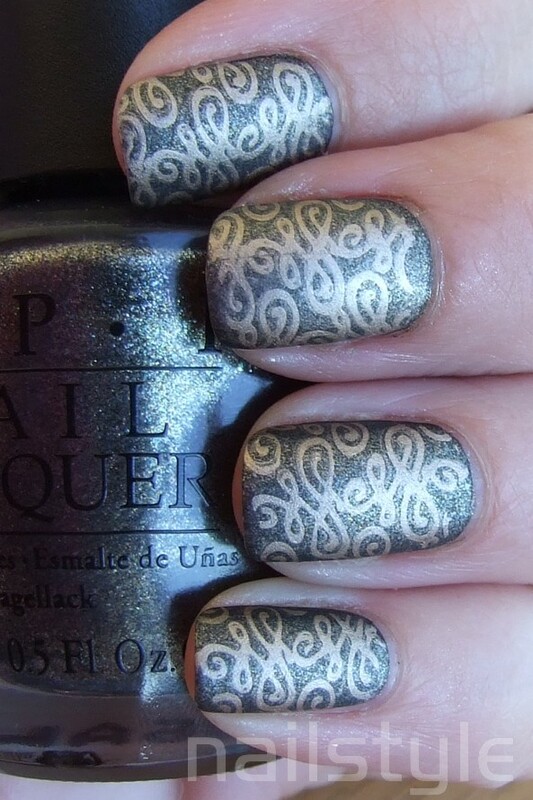 Here's what I came up with using my new Drikk stamping plate. I wasn't thrilled about the final result but I liked it a lot better in a matte finish. I love the stamp design! Number One Nemesis looks amazing! Inthinkmthis is really awesome! I need to use that stamp design. So very cool. I really like the color combo, but not a fan of the design..not sure why. On there own they are all lovely elements!